I can feel a huge descriptive fail coming on because too much happened in America. 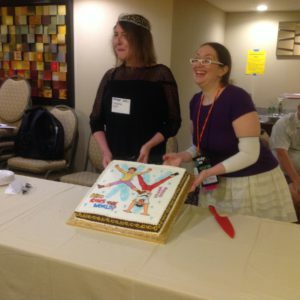 It’s WisCon that’s the truly important part. Yes, I did get to wear the Elise Matthesen silver and pearl tiara. 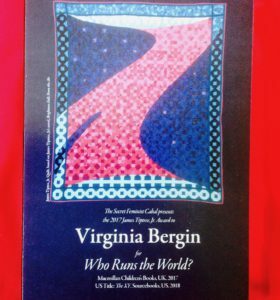 Yes, there was a Who Runs the World? cake, made by Georgie Schnobrich – and many other gifts, including a book created by artist Gena Ollendieck. 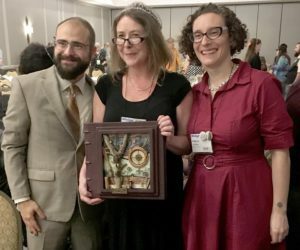 There was speaking – I did various events, including a 75-min solo slot and a much more terrifying 5-min ‘thank you’ speech (scary because how do you follow Saladin Ahmed and Tananarive Due?) – and there was singing: the Tiptree Choir led 700-ish guests in a WRTW? singalong to the tune of Auld Lang Syne . . . see what I mean? Too much happened. 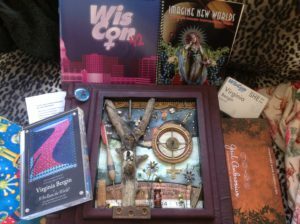 But the most important part of the truly important part is how special WisCon itself is. It’s a dynamic, thought-provoking and inspiring event full of very lovely people. I met way too many of the very lovely people to name individually (eg Orange Mike, Dr K and Margaret), but it would be very wrong of me not to thank the Tiptree Motherboard: Pat, Sumana, Jeanne, Alexis, Jeff and Gretchen. THANK YOU!